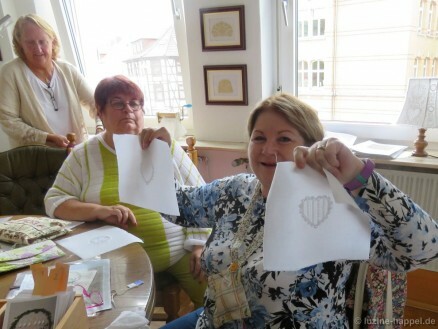 Recently, ladies from the “Still Stitching with Susan and Sally” group again visited Eschwege to further their knowledge of Schwalm whitework with me. The women came from the United States and the Netherlands. 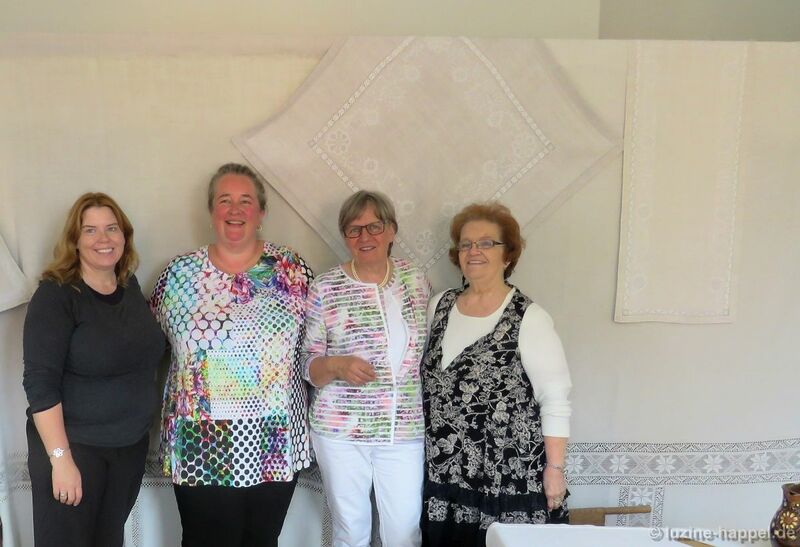 Unfortunately, Susan Greening Davis, one of the initiators, could not be present this time, so Sally Criswell alone accompanied the group. 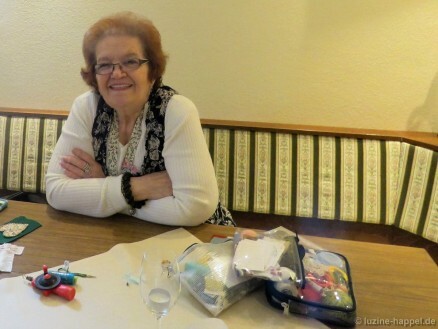 #1 (the Happel Hearts) and Lesson #2 (the Tulip Wreath) in 2015. 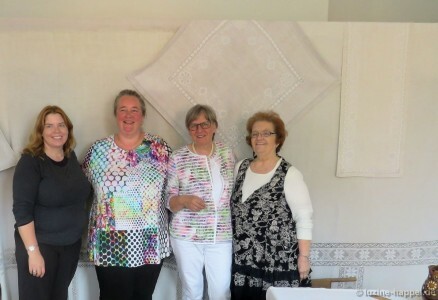 Included in the group were three needlework shop owners: in the United States, Sally Criswell of Suwannee Valley Cross Stitch and Kimberly Young of Sassy Jacks Stitchery, and in the Netherlands, Annemiek Koning of De Handwerk Boetiek. 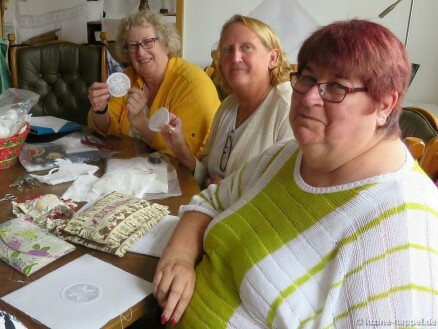 Both Kimberly and Annemiek plan to stock all the needed materials and equipment for Schwalm whitework, especially the Weddigen linen with 13.5/cm thread count! 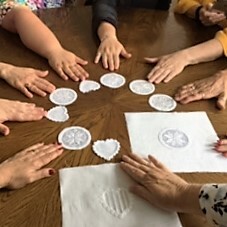 In addition, both ladies plan to offer Schwalm whitework classes in the near future. In my opinion, every student should be able to finish the workshop project within the workshop time frame. Because the workshop was extended to four days, it was not as strenuous as last year to manage this. Of course, only a small piece can be embroidered within a restricted time frame. Lesson #3 involved a circle design with an openwork pattern. To prevent any confusion due to language barriers, I made a detailed step-by-step instruction booklet, which was perfectly edited by my professional editor Joey Colbert. 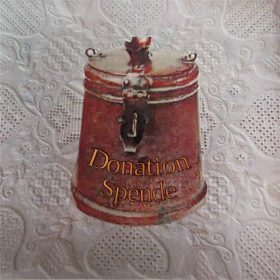 It also enabled the embroiderers to continue working in their spare time. The hotel provided a room with plenty of space for the women to work comfortably. They were very motivated and concentrated very hard. Sometimes it was so quiet one could hear a pin drop. As a result, other topics of interest to the students could be explored. The finishing work of boiling, ironing, and cutting was done in the workrooms at my exhibition. This meant that I didn’t have to bring all the necessary equipment to the hotel, but it also allowed the women to visit the exhibition (which was, of course, on the agenda anyway). The ladies were astonished at how the shrinking from boiling positively affects the appearance of the piece. In the end, all the students were happy to take a finished piece home. Some were especially proud to have finished two pieces! Everyone learned a lot throughout the workshop – including me. What? I’ll tell you in a future post. Hi! I enjoyed this post, and so wish I was able to be there. Bigger piece with ivy on it, which I bought at your museum. I am glad that your tulip wreath doily turned out well. Thank you for telling me. Always enjoy working on your bigger piece.